In 1988, The Economist magazine ran an article on Ireland titled “The poorest of the rich.” The title was well-deserved. That year, Irish per capita GDP was just 70 percent of the figure for the United Kingdom and 52 percent that of the United States. The unemployment rate was 16.2 percent compared to 8.5 percent in Britain and 5.5 percent in the United States. Irish government debt amounted to 85 percent of GDP compared to 60 percent in the United States and 37 percent in the United Kingdom. This title was equally well-deserved. 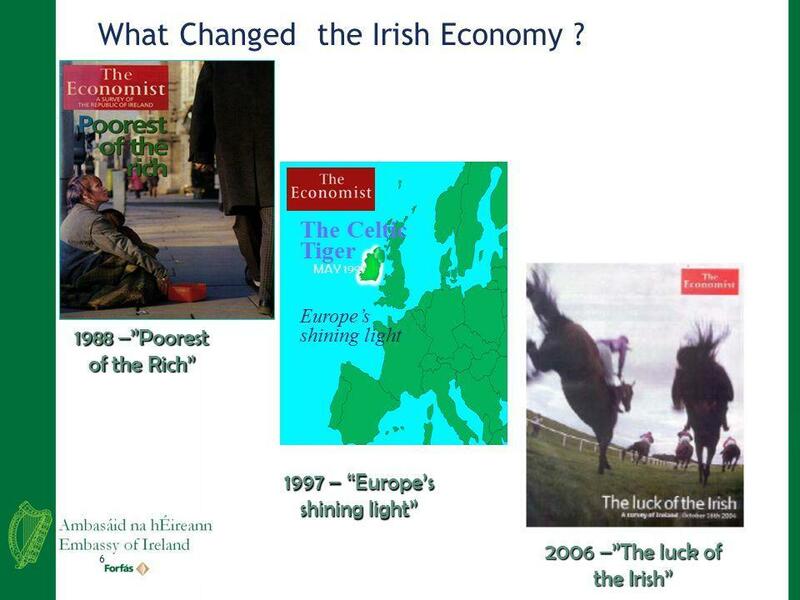 The Irish economy grew at an average annual rate of 9.4 percent between 1995 and 2000. Real GDP growth outpaced that in the United Kingdom in every year from 1989 to 2003 and that of the United States in every year after 1993. While Ireland’s GDP grew by 229 percent between 1987 and 2007, in the United States the figure was 161 percent, and in the United Kingdom, it was 152 percent. This led to a surge in the level of Irish per capita GDP after 1993. In 1997, Ireland overtook the United Kingdom on this score and, by 2007, was 27 percent above it and up to 96 percent of the United States’s level. Unemployment tumbled after 1993. Between 1993 and 1999, about 415,000 extra jobs were filled, an increase of 35 percent, virtually all of it in the private sector. By 1999, Ireland’s unemployment rate was below that of the United Kingdom. By 2001, it was below that of the United States. So long an exporter of people, Ireland became an importer. Net migration changed from a loss of 5,000 in 1993 to a gain of 22,800 in 1998. This increased prosperity worked wonders for Ireland’s government indebtedness. From 1993, government debt as a share of GDP fell rapidly, reaching 25 percent in 2007. By 2002, it was lower than the ratio in both the United States and the United Kingdom. The Irish hadn’t found the mysterious pot of gold. They had simply embraced sound fiscal and monetary policies. According to economist Dermot McAleese, in the years prior to The Economist’s 1988 diagnosis, Ireland had been plagued by “High taxes, low confidence, high labour costs, excessive regulation and anti-competitive practices.” And no matter how high tax rates were, spending was higher still, which meant large fiscal deficits. By the beginning of the 1990s, it had become apparent that this could no longer continue. Acting boldly, the government—with wide support—slashed spending and made credible commitments not to engage in deficit spending or inflate the currency. It deregulated and drastically lowered tax rates. The 2002 Index of Economic Freedom, published by the Wall Street Journal and The Heritage Foundation, ranked Ireland the world’s fourth freest economy. The espousal of fiscal rectitude and new consensus economic policies was not in fact new. What was new was the decision to attack the debt by controlling public spending, rather than by increasing taxes. For a small, open economy, curbing public spending proved a far more productive way forward. It created room for tax cuts while simultaneously lowering the debt ratio. Another ploy was the introduction of a tax amnesty. Following on the high tax policy of the 1980s and the reorientation in fiscal policy, it proved hugely successful in terms of revenue generation. Domestic interest rates fell steeply as investor confidence grew, thus starting off that rare occurrence in modern economics, an expansionary fiscal contraction. Fears that strong fiscal contraction would prove deflationary were confounded, though precisely why this was so remains the subject of controversy. One of the headline cuts was to Ireland’s corporate tax. Until the late 1980s, the standard rate of corporate profits tax (CPT) was 50 percent with a 10 percent rate on all corporate profits for export-oriented manufacturing and traded services. Ireland replaced this system in 1997 with a 12.5 percent rate of corporation tax for trading income from January 1, 2003. These low rates brought high revenues. In 2004, corporate income taxes accounted for 13 percent of all tax revenue in Ireland compared to 6 percent in the United States and 8 percent in the United Kingdom. This is now under threat. You might have expected Ireland’s partners in the European Union (EU) to look at that country’s success and think, ‘Here is something to be emulated.’ Instead, they see it as something to be stopped. As businesses choose to locate in Ireland rather than high tax jurisdictions elsewhere in the EU, those higher tax countries are attempting to force higher tax rates upon the Irish via the EU. Until now, the Irish have doggedly defended this. In 2008, the Irish voted to reject the European Constitution because, among other things, they wanted to safeguard their successful low tax policies. But in the EU, votes are not opportunities for electorates to make decisions but for them to rubber-stamp decisions already taken by EU leaders. So the Irish were made to vote again. They were given assurances that the new Lisbon treaty—the renamed constitution—would, among other things, affect their taxation policies. In 2009, they dutifully voted yes to Lisbon. Of course, the EU never abandons an idea, it only delays it, and the EU started the year by coming for Ireland’s low taxes once more. At present, some decisions on tax policy have to be taken unanimously, giving countries like Ireland a veto. But the European Commission—the unelected executive body of the EU—is moving to end that. The low taxes upon which Ireland’s modern economic miracle are based are unlikely to outlive unanimity by very much. Unsurprisingly, many Irish are not keen on being stripped of the ability to set their own tax rate. The Irish Citizen Army, which fought against British rule in the Easter Rising of 1916, flew a banner reading “We serve neither King nor Kaiser but Ireland.” By contrast, Leo Varadkar’s Fine Gael government has loyally done as the EU told it to during the Brexit negotiations. If the Irish were hoping that their reward would be tolerance towards their low tax economic model, it looks as though they will be disappointed. CRISPR now being used to develop better antibiotics: Scientists engineered a defanged form of CRISPR, CRISPRi, that is unable to cut DNA, but sits on the DNA to block proteins from turning on genes. The bacteria becomes much more sensitive to drugs, making it easier to screen for new antibiotics.